Our climate-controlled storage buildings were specifically designed to protect your belongings from the fluctuations of New England weather. They are equipped with heaters, air conditioners, humidifiers and dehumidifiers to maintain a consistent temperature and humidity within the building. The temperature ranges from 50 degrees in the winter months to 80 degrees in the summer months, with a humidity level between 35% - 55%. If you are storing items like furniture, electronics, art, photos, or files that are sensitive to temperature and humidity, then you may want to consider climate-controlled storage. 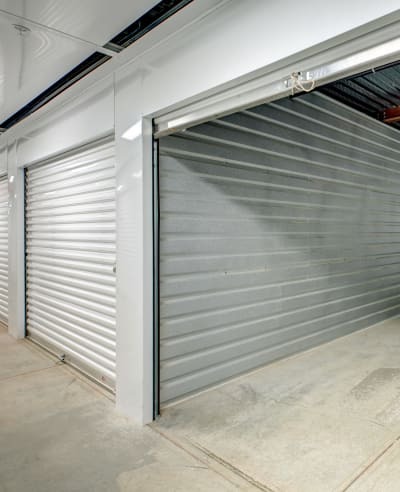 If you are going to be in and out of your storage unit often or need to spend time in there to organize, you may want to consider climate-controlled storage for your own comfort. Climate-controlled storage can be either drive-up ground level access or hallway accessible. Not sure if climate controlled is right for you?